To celebrate the official launch of their Alpha Collection, the kings of the khaki’s Dockers® have created the Alpha Series, an event focusing on style and entrepreneurialism. Check out this trailer video to find out more. Selecting some of their favourite creatives and entrepreneurs from the London area, the folks at Dockers® have put together an evening of entertainment featuring Q&A sessions from the Krankbrother duo, Olly Wood from Black Butter Records, James Benenson from Found Series and comedian Jeff Leach as well as DJ sets from PBR Streetgang, Gorgon City and Krankbrother. To put it plainly, it’s a collective of modern day men of style sharing their influences and passions with a lucky few at Number Six on Dray’s Walk, Brick Lane. The video above acts as an introduction to both the event itself and some of the main people taking part. It’s always interesting to hear the viewpoint of entrepreneurs and those who have managed to cut their own path in life, and this short video doesn’t fail to wet the apatite for this Thursday’s event. 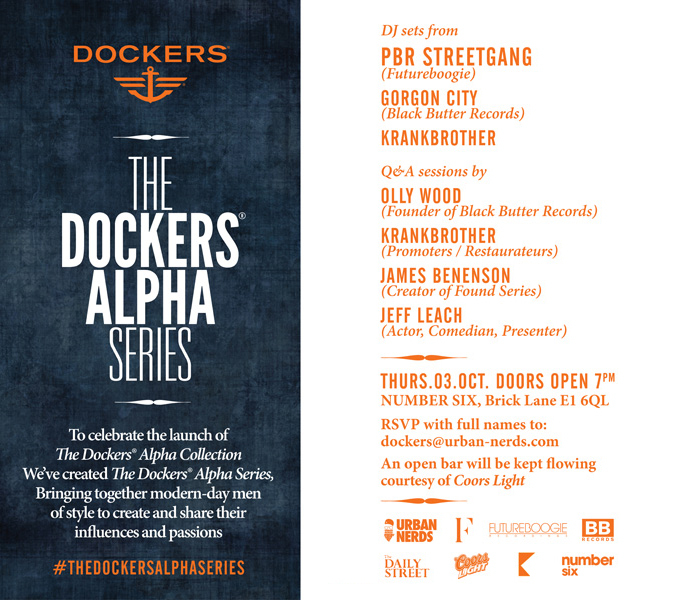 Make sure you RSVP with full names to dockers@urban-nerds.com to be in for a chance of attending the event. Full info on the flyer below. See you on Thursday!